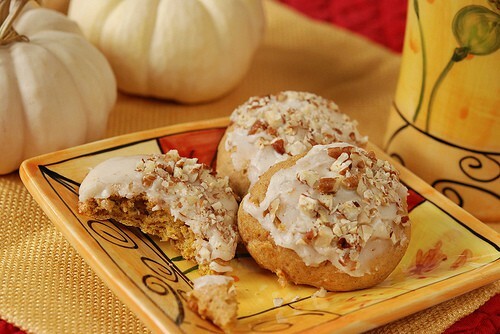 Soft Pumpkin Cookies with Browned Butter Icing are cake-like spiced cookies flavored with pumpkin and cinnamon. Recipe for Browned Butter Icing included. It’s hard to beat pumpkin pie, but these Soft Pumpkin Cookies with Browned Butter Icing are right up there when it comes to celebrating the fall season. Delicately flavored brown butter icing, which you can make in the microwave, complements the cinnamon and pumpkin perfectly. Chopped pecans add not only class but also flavor and crunchy texture to this otherwise simple cookie. Are you wondering what to do with the leftover pumpkin? Read about three ideas for what to do with 1/4 cup of pumpkin. Cream shortening and sugars. Add eggs and combine. Add yogurt, vanilla and pumpkin. Combine with flour, salt, baking powder, soda and cinnamon. Drop by tablespoonfuls on cookie sheet. Bake at 350 degrees for 10-12 minutes . Add 2 cups powdered sugar and 1 tablespoon warm milk. Beat until smooth. May need to add more sugar or milk to get the right consistency. As it cools, it gets thick—just add a little more milk and stir. Ice cookies. Before icing dries, sprinkle with chopped, toasted pecans. These freeze beautifully. Wrap well. Can you use butter flavored shortening with these instead? Did I already answer your question? If not, I’m sorry it has taken so long. I think the butter-flavored shortening would be fine, although I have not tried it myself. I am up early and cannot wait for daylight to maake thes cookies. ( Maybe for breakfast ). thanks for visiting my blog! I hope your hubby enjoyed the cartoon and I hope his door problem is fixed. 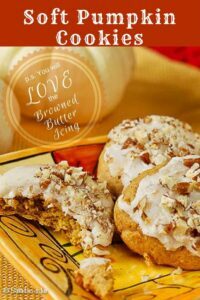 I’m cookin’ with my rugrats tomorrow and these cookies are on the list! Love your blog! You are right. They are similar. The icing is exactly the same. Glad you are enjoying the cinnamon cookies. Awe, your cookies look SO good! I was lucky enough to taste this wonderful recipe at Romaine’s home recently but I am not responsible for that bite out of the cookie pictured. I couldn’t resist and ate all my cookie. I am so glad to have the recipe now. YUM . YUM. ! ! ! Don’t forget that my house is on your way to work. If you ever need taste testers…we’re available 😉 These look delicious!! !